What a difference .01 makes. After stoners continued to steal a “Mile 420” sign on I-70 in Colorado, the state’s Department of Transportation finally responded with a solution that has worked so far – replace it with a “Mile 419.99” marker. “Obviously people steal these signs,” CDOT spokeswoman Amy Ford told the Denver Post. Mile 420 is about 25 miles from the Kansas border. 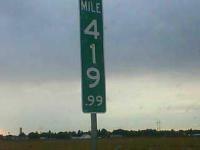 Most highways in Colorado aren’t long enough to have a “Mile 420” sign.